Despite the importance of 1930s New Deal policies for fostering American artists and encouraging the display of public art in the United States, few scholars have attempted to group the disparate US governmental agencies formed under the New Deal into one publication in order to understand their overarching cultural impact. More commonly, researchers have chosen to focus on one artist, region, or organization, thus providing depth of knowledge on New Deal policies, but not breadth. 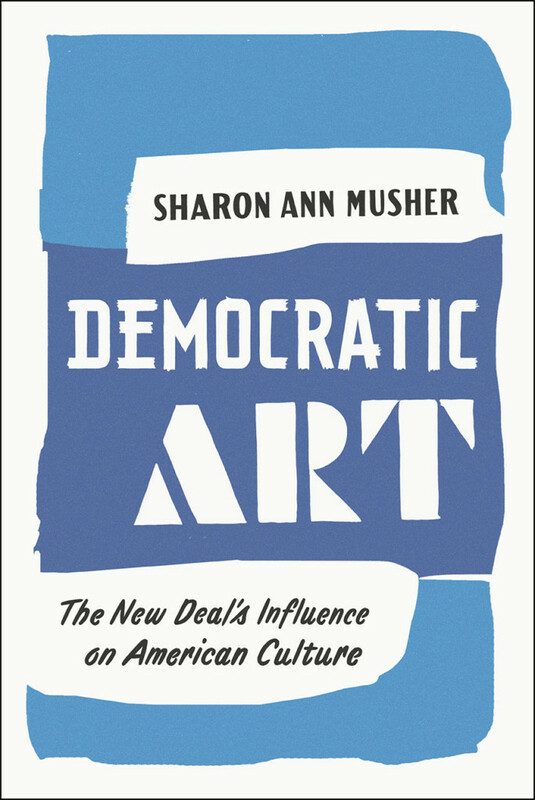 Sharon Musher, Associate Professor of historical studies at Stockton University, rectifies this oversight by devoting her book, Democratic Art: The New Deal Influence on American Culture, to answering questions regarding how governmental agencies functioned during this pivotal period. She questions why the US government chose to support artistic endeavors and how their strategies for remaining relevant shifted as the political landscape changed. Musher explains, “by tracing the range of aesthetic visions that flourished during the 1930s and what New Deal art meant for its creators, administrators, and audiences, this work seeks to understand both the temporary flowering of government funding of the arts at the time and why its success was so fleeting” (2). Musher’s study spans government agencies and delves into archival materials in order to unearth the cultural meaning of the New Deal to the millions of Americans who benefited, and continue to benefit, from its policies. Specifically, she explores the Works Progress Administration’s Federal Art Project (FAP), Federal Theatre Project (FTP), Federal Writers’ Project (FWP), and Federal Music Project as well as the mural and sculpture projects associated with the Treasury Department, and the photographic divisions connected with the Resettlement Administration, Farm Security Administration (FSA), and Office of War Information (OWI). Her decision to remain focused on the administration, reception, and regulation of these projects is where she is most successful in bringing new arguments to the field. Her use of archival sources, including significant correspondence and government memos, complement congressional reports and speeches and bring new subtlety to our understanding of the heated debate among artists, administrators, the public, and Congressional committees regarding the role of governmental support. Following an introductory chapter, Musher examines what she sees as five modes for communicating definitions of American art; “Art as grandeur,” “enrichment,” “weapon,” “experience,” and “subversion.” Following the book’s organization, each of these five chapters examine how American organizations and artists sought to inspire the public through the display of classical iconography (grandeur); to enrich the lives of others through regionalist aesthetics and local projects (enrichment); to utilize art as a political tool to combat inequality (weapon); to experience art as a creative process (experience); and the response of those invested in minimalizing government power (subversion). Significantly, Musher also recounts how congressional committees and local administrators disavowed government-sponsored art for simultaneously promoting radical ideology and encouraging mediocrity among artists. By bringing public administrators into the discussion of American art, this framework widens the previous discourse on New Deal policies as purely politicized acts. Given the diversity of materials covered in her publication, Musher attempts to situate her readers, despite their distinct research interests, on the same metaphorical footing. For each government program, Musher devotes her attention typically to one object, performance, or publication. At times, Musher demonstrates a seeming discomfort with artworks, limiting formal descriptions to a few sentences in captions beneath photographs or precluding remarks entirely. This opens up the possibility for future art historical scholarship that can build upon Musher’s careful research and delve more deeply into the formal qualities of these artworks. In her “Introduction: Art as a Function of Government,” Musher argues that American art took on new meaning as a national ethos during the 1930s. As such, she questions why Americans embraced national art programs and, consequently, a strong federal government during the 1930s. Further, she asserts that “New ideas emerged regarding tax payers’ responsibility to support the arts, to keep the United States culturally competitive, to foster meaningful creative opportunities for US citizens, and to avert both radicalism and fascism.” (6) More than describe why Americans were receptive to the New Deal in the 1930s, Musher summarizes the long-term implications of New Deal policy. As it attempted to democratize the arts, it also promoted social realist iconography, treated artists as laborers, and influenced artists’ subsequent work during the 1940s and 1950s. Chapter One, “May the Artist Live?,” explores the development of public support for American artists as private benefactors ceased to be their primary patrons. Employing newly discovered period sources, Musher examines how Americans began to think of employment as a civil right that required governmental oversight. As a foundation to frame these changing expectations, Musher outlines the economic theories underscoring governmental support. She complements this brief analysis with an introduction to the writings of John Dewey, Thorstein Veblen, and John Cotton Dana, all of whom she returns to in subsequent chapters when describing their influence on New Deal administrators. In her analysis of these governmental agencies, she argues that in 1935, programs more generally shifted from skill- to need-based support. Despite these general pronouncements, different agencies had different agendas, different levels of monetary support, and, consequently, different levels of success as determined by the agencies and the public. The evolving role of Classical Revival, an aesthetically and politically conservative movement drawn from the Beaux Art and Art Beautiful projects, form the locus of her second chapter, “Art as Grandeur.” Here Musher focuses on the strategies employed by the Commission of Fine Arts (CFA) and Charles Moore, who chaired it for twenty-two years. Specifically, Musher argues that CFA promoted the Classical Revival as a national movement that looked to European precedents as a means of creating a long lasting culture. She makes a compelling case by examining how CFA revived Pierre L’Enfant’s 1791 vision of Washington, DC by redesigning portions of the Federal Triangle neighborhood. In order to demonstrate classicism’s relevance well into the 1940s, Musher describes the development of the Jefferson Memorial by John Russell Pope between 1939 and 1943. While choosing not to describe the Memorial’s layout or pedimental iconography, Musher argues that, despite adhering to the prescribed classical revivalist style, its location ran contrary to the wishes of CFA, which insisted on returning the city to its original L’Enfant plan. She concludes this chapter by aptly demonstrating the complexities of the movement; here, administrators and architects had different interpretations of an artistic movement’s significance and how it could best benefit citizens. Her third chapter, “Art as Enrichment,” reads as a counterpoint to her research on classicism by examining Americans artists’ investment in local materials, scenes, and traditions through the display of regionalist aesthetics as part of the larger American scene movement. Citing Franklin Roosevelt’s famed “a more abundant life” speech as a sign of larger cultural shifts, Musher argues that Americans recognized the need for ethical reform in society and the desire to work for the common good. To illustrate this shift, she uses the words of Assistant Secretary of the Treasury L. W. Robert Jr.: “The work of artists and craftsmen greatly aids everyone by preserving and increasing our capacity for enjoyment, and is particularly valuable in times of stress.” (64) Musher describes Edward Bruce, Forbes Watson, and Edward Rowan, the administrators charged with managing the Treasury Department’s mural and sculpture sections, as the arbiters of taste. As she rightly interprets, these three administrators had different agendas: to Bruce the government should enlighten people, to Watson it should create a national identity, and to Rowan government projects should emphasize regionalism. She turns to two sets of murals, George Biddle’s Society Freed Through Justice at the Department of Justice in Washington, DC and Victor Arnautoff’s City Life, Bernard Zaheim’s The Library, and John Langley Howard’s California Industrial Scenes in San Francisco’s Coit Tower as a means to draw out national motivations and illustrate the pressures of political events or congressional opinion on artists. For example, Musher compared Biddle’s finished work “Sweatshop” to its preparatory drawing to demonstrate how pressure from congressional leaders, who saw Biddle as a radical sympathizer, influenced the artist’s image of the American worker. Comparing the two versions reveals that Biddle transformed the worker’s role into one that was more observant and less resigned, and he altered images of women into men in the final piece. In addition—although Musher does not explicitly address this point—pressures on Biddle led him possibly to recast the immigrants as an earlier, and to the viewing public safer, generation. He transmuted ethnicities from eastern to western European by lightening hair color, changing facial features, and adding a corncob pipe—the ubiquitous sign of Irish stock—in the final mural. In “Art as a Weapon,” her fourth chapter, Musher describes how the efforts of the Federal Theater Project and its Director Hallie Flanagan; the Federal Writers’ Project, organized by Henry Alsberg and Sterling Brown; and Roy Stryker’s Information Section of the Farm Security Administration, each highlighted the nation’s challenges in order to pressure Americans to find solutions. As she did in her discussion of New Deal ideology, Musher seeks to locate the origin of art’s politicization by administrators. To Musher, these government initiatives were influenced by Russian communist precedents that had been transplanted to the United States via the Popular Front between 1935 and 1939. For example, she summarizes the radicalism of the FTP, and the significance of Flanagan as a Washington outsider, by examining the public and governmental response to One-Third of a Nation (1937-1939), the play on tenement housing from the Living Newspapers series. Unsurprisingly given Flanagan’s ideology and uncompromising character, the FTP was one of the first projects to lose federal funding. By contrast, the FWP was less expensive, more accommodating to shifts in congressional opinion and was the most geographically diverse of the organizations under consideration. For example, with The American Guide Series, the FWP attempted to be more inclusive of marginalized communities when writing about a state’s history, but struggled with local administrators who wanted to exclude or recast historical periods, such as slavery. The longest lasting and most ideologically flexible of the government institutions was the Farm Security Administration. As other scholars have argued, the economist Roy Stryker believed that photography could shed light on class divides, and he sought to simplify complex issues by equipping photographers with reading lists and shooting scripts. While others have discussed Stryker’s relationship with publicity firms and periodicals, Musher’s discussion of the exhibition How American People Live is a welcomed addition to the discourse on FSA photography. Employing John Dewey’s 1934 publication Art as Experience as her fifth chapter title, Musher examines the rhetoric and aspirations of administrators such as Holger Cahill at FAP and Charles Seeger and Margaret Valiant at the Special Skills Division of the Resettlement Administration. Each argued that the process of producing an artwork was more important than the finished product and sought methods to engage the public in this dialogue. Each, in turn, pulled their theories from cultural anthropologists such as Ruth Benedict, Margaret Meade, and Franz Boas. As an example, Musher cites the administrators’ interpretation of vernacular art as a vital form of cultural expression. Following resistance from Congress and local communities, FAP turned from treating art as a weapon to treating it as means to broaden civic engagement. Cahill coordinated public engagement through the well-known Index of American Design and ubiquitous community centers populating cities nationwide. Musher astutely argues that the index, while widely admired, actually had a limited influence because few scholars utilized the resource, while the community centers were successful with local residents. So much so that when government funding stopped, residents took control of these buildings and many of the centers remain in use today. In contrast, Seeger and his most dutiful employee Valiant, were for the most part unsuccessful in their campaign to preserve folk music by providing opportunities to hear it, and consequently the Special Skills Division was short lived. In her sixth chapter, “Art as Subversion,” Musher rightly notes that the opposition to New Deal projects drew together “an alliance of strange bedfellows: Republican and southern Democratic congressmen; local officials and policemen; mainstream journalists, veteran and patriotic groups; academic, anti-Stalinist, and anti-Communist artists and intellectuals; and even socialite debutantes” (172). Their alliance grew from their shared belief that market competition was necessary for aesthetically and socially meaningful art. To prove her point, Musher argues that between 1932 and 1937 the alliance grew increasingly concerned that government funding for the arts would reduce art to a weekly paycheck. By 1938, Martin Dies’ Congressional Committee focused on rooting out communism sympathizers in the arts by spreading accusations and refusing administrators a chance to testify. In response to Dies’ accusations and the growing hysteria about communism, Congressman Clifton Woodrum and government administrators tried to stamp “radicalism” out of the arts. Her “Conclusion: A New Deal for the Arts?” questions the long-term significance of the New Deal projects and argues that Americans are unlikely to back large-scale government support for the arts again. As part of her discussion, she traces the negative political response to Anton Refregier’s epic History of San Francisco—one of the nation’s most expensive commissions during the Great Depression—from the 1940s to the 1970s and shows how the murals narrowly escaped destruction before receiving protected status. In sum, Musher’s work addresses well-trodden art historical topics on the FAP and FSA. However, her focus on the art administrators, the artworks’ public reception, and the changing governmental landscape brings a new voice to the discourse. Equally important, Musher unearths new primary sources, untouched in academic journals and scholarly publications, that provide a fuller picture of the motivations and influences of the CFA, FWP, and FTP. As a social historian, Musher offers a refreshing analysis that is relevant to the fields of art history, cultural studies, literature, music history, labor studies, and African American history. About the Author(s): Caroline M. Riley, Ph.D., is an independent scholar specializing in in the visual culture of the 18th century to present from the United States, Great Britain and France.